Like everyone else on the planet I’ve been busy, but I make time to pitch another Dave Barry classic. Barry’s humor fits like a well-worn glove that slides over chapped skin. He’s comfortably funny. From the opening paragraph Dave Barry in Cyberspace is a riot. No need for warm-up exercises; Barry hooks you before reaching the period in the first sentence. 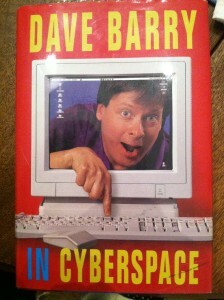 Barry wrote Cyberspace in 1996 a few short years after Al Gore invented the internet. For an old book his writing is timeless. Whether Barry writes about millennium history, turning 40, turning 50, or relationships, he’s out of this world. Dave Barry is from both Mars and Venus. Published by Crown Publishers, find “Dave Barry in Cyberspace” in either a big-box book store, neighborhood book store, used book store, in cyberspace [at a site called Amazon] or at Dave’s web-site. Enjoy the laughs. For more profiles on funny writers visit the Etc. Guy Humor Project link. Visit the Etc. Guy Facebook page too.